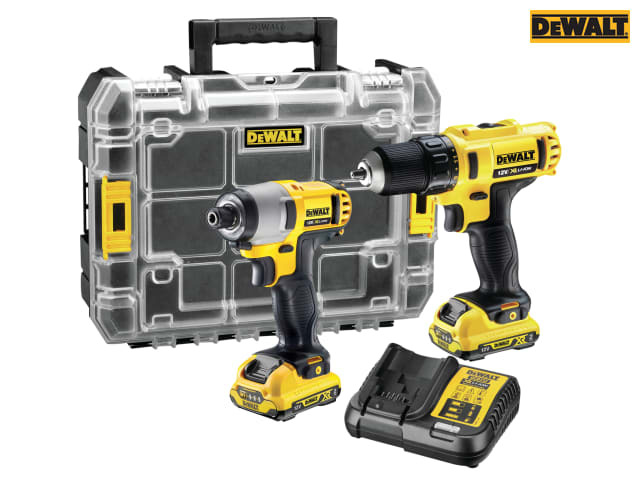 1 x 10.8 Volt DCD710 XR Sub Compact Drill Driver with adjustable torque control for consistent screwdriving into a variety of materials. 10mm single sleeve keyless chuck with automatic spindle lock for quick and easy bit change. All metal gearing for efficient power transmission and long tool life. 1 x 10.8 Volt DCF815 XR Impact Driver with all-metal gearing and aluminium front housing that provides greater heat dispersion for increased motor life. 3 LED 'Halo' Ring provides illumination of the workpiece. 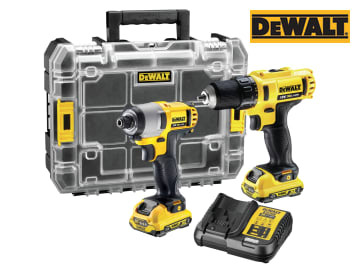 Supplied with: 2 x 10.8 Volt 2.0Ah Li-ion Batteries, 1 x 10.8-18V Multi-Voltage XR Charger and 1 x TSTAK™ V Toolbox. 1 x 10.8V DCD710 XR Sub Compact Drill Driver. 1 x 10.8V DCF815 XR Impact Driver. 2 x 10.8V 2.0Ah Li-ion Batteries. 1 x 10.8-18V Multi-Voltage XR Charger. 1 x TSTAK™ V Toolbox.